New York, Oct 21, 2010 (Global Fashion Wire) - Ralph Lauren has revealed his flagship new womens store on 888 Madison and 72nd Street, reminiscent of grand Beaux-Arts architecture of the early 20th Century, the exterior's Neoclassical French design was inspired by the rich architectural heritage of the Upper East Side. The stately four story building's scale and detailing are an elegant complement to the Rhinelander Mansion. The store's interior displays feminine details in the Neoclassical style creating an elegant and intimate setting for three floors of glamorous salons dedicated to luxe women's apparel and accessories and a full breadth of the Ralph Lauren Home Collection which is situated on the fourth floor. Ralpha Lauren has used a feminine rococo design flowing throughout creating an elegant and dynamic counterpoint to the masculine, stained mahogany and oak world of the Rhinelander Mansion. Using limestone and parquet wood flooring, french polished millwork, hand-cast plaster paneling and moldings, and decorative wrought-iron metalwork. The store emphasizes luxurious crystal chandeliers, authentic persian and antique auboson rugs, antique furniture and artwork, hand-blocked wall coverings and rich fabric upholstery. On Madison Avenue, the entrance opens to the main salon with a backdrop of stained mahogany wood cases with hand-carved detailing revealing a luxurious display of Ralph Lauren handbags and leather goods, with openings leading to a series of magnificent salons showcasing fine watches and jewellery, accessories and footwear. A focal point of the ground floor is the Watch & Fine Jewellery Salon, the first of its kind in the U.S. This intimate salon will showcase the three iconic collections of Ralph Lauren Timepieces - the Ralph Lauren Stirrup, Ralph Lauren Slim Classique and Ralph Lauren Sporting - and the exclusive debut of Fine Jewellery. Arriving via the staircase, on the second floor the Grand Salon displays the modern elegance of Collection runway apparel and accessories, also situated on the second floor is the VIP suite and tailoring room where an exclusive offering of women's 'Made to Measure' services will debut and the premiere of the Ralph Lauren Collection Sleepwear, exclusive to the new flagship. The Collection Sleepwear for women is inspired by the couture luxury of Ralph Lauren's dramatic runway Collection and is fashioned from the finest silk and cashmere in glamorous colour palettes. The third floor, opens into a swing shop highlighting the chic sophistication of Black Label which sets the tone for the floor each season, as well as featuring the youthful elegance of Blue Label on this floor including footwear, handbags and belts. Connected to the Main Salon is a dedicated women's RRL and RLX shop and the signature 'Create Your Own' area allowing shoppers to personalize their apparel instantly, using an innovative touch-screen display. Customization is completed and finished in-store allowing shoppers the convenience of leaving with their new items directly after shopping. Taking the Grand Staircase to the top you find a floor devoted to Ralph Lauren Home. The space will feature two dramatic seasonal lifestyle collections and an iconic luxury assortment of gifts, decorative accessories and tabletop products, as well as fine bed and bath linens. A comprehensive design center completes the presentation with a full representation of furniture, fabric, wallcovering, lighting and window hardware. 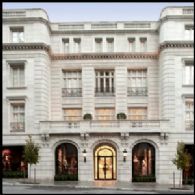 Across the avenue at 867 Madison, the Rhinelander Mansion has been extensively re-envisioned and positioned as the Company's first men's-only flagship store. The flagship's four floors will feature the full breath of iconic Ralph Lauren menswear and accessories, including dedicated areas for Purple Label, Black Label and Polo, plus shops for RRL and RL Active. Continuing Ralph Lauren's tradition of excellent service, the shop will feature custom tailoring, Made to Measure and Made to Order, and exceptional personalization services. "Over twenty-five years ago I stood on the corner of Madison and 72nd Street and watched the amazing restoration of the historic Rhinelander Mansion. I invited people into a world, not just a store. Today I Stand on the opposite corner reveling once again in the elegant beauty of a new mansion. It is the most romantic setting for all my women's collections, accessories, fine jewellery and home. It fulfills my dream of the ultimate experience for women in New York City" - Ralph Lauren.